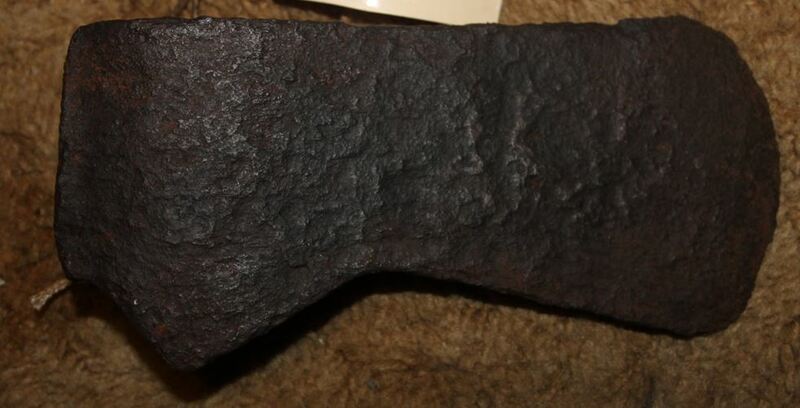 Double-bitted saddle axe with a period octagonal oak haft found at a ranch in Northwest NM. Ca. 1820-1860; 7.25” X 2.25” X 21.5”; Wt. 1 lb. 13 oz. ; Small enough to put in packs or hung on saddles & could have been used by nearly any traveler on the Western frontier. It likely had a leather sheath at one time. 5 5/8” X 4 1/8” Camp axe. Similar ones have been found at the Jamestown site. They could be used for general camp chores, hewing & shaping small planks/timbers into whatever is desired. 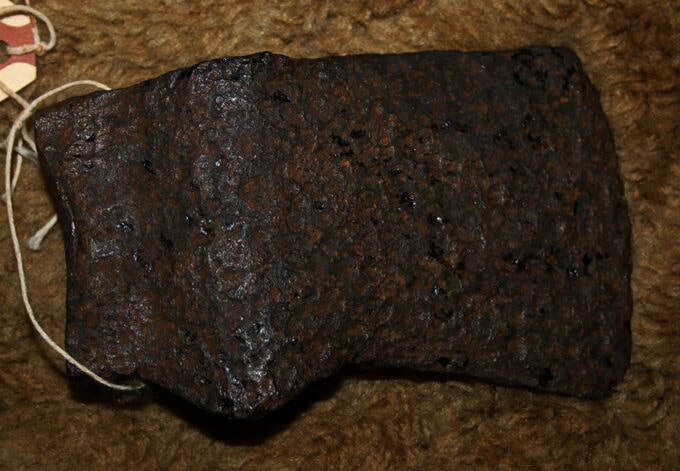 18th C. to early 19th C. double bladed hand forged frontier hatchet with steeled edges & period haft. Head is a total of 5.15" wide & 2.5" wide blade. 14.25" overall. At some point somebody decided it needed a little sanding on the end of the haft a few decades ago. These were small enough to fit in a pack or on a belt --likely with a sling sheath. 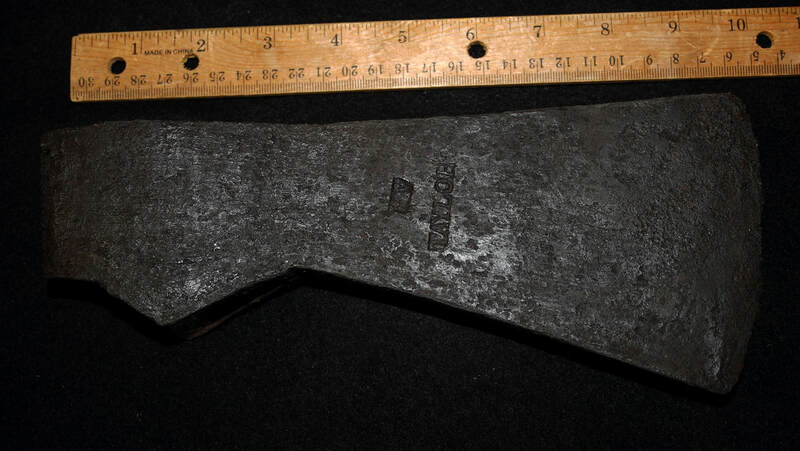 Another British felling axe 8" long. 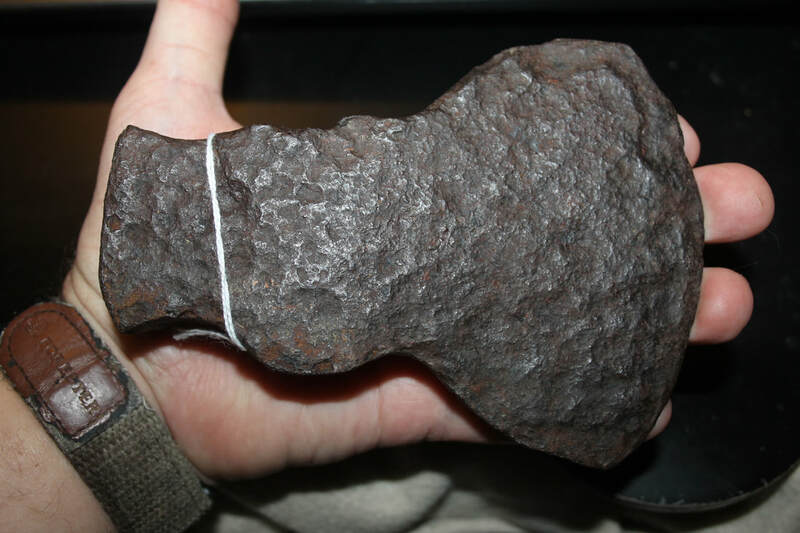 Metal detected at Revolutionary War camp site by Battle of Cowpens (Wando River Site) Charleston, SC. among other Rev. War artifacts. 2 lb. 14.5 oz. 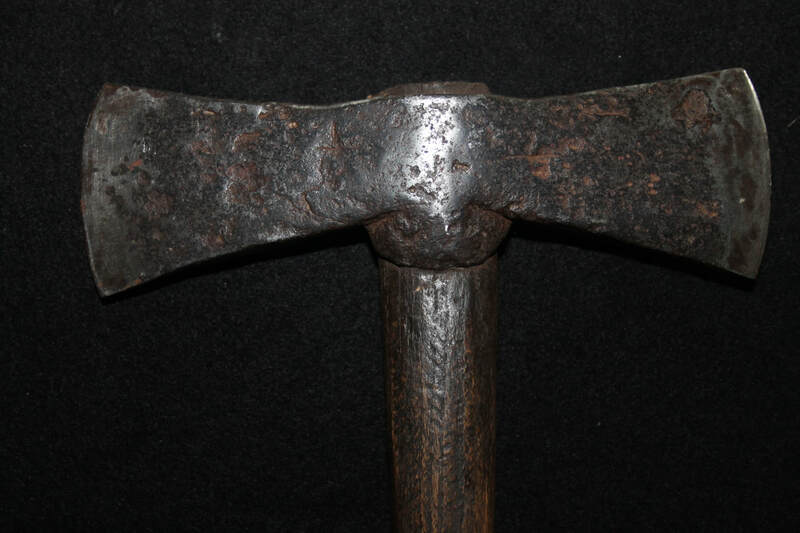 Circa early 19th C. frontier forged felling axe metal detected in Nebraska. It is forged differently than most by the two halves being forge welded flat together around a mandrel & the no steel on the poll end. Some refer to this as a 'Spanish' style but I've found no evidence that that term is accurate. 6” X 3 ¾”; Wt. : 2.5 lbs. 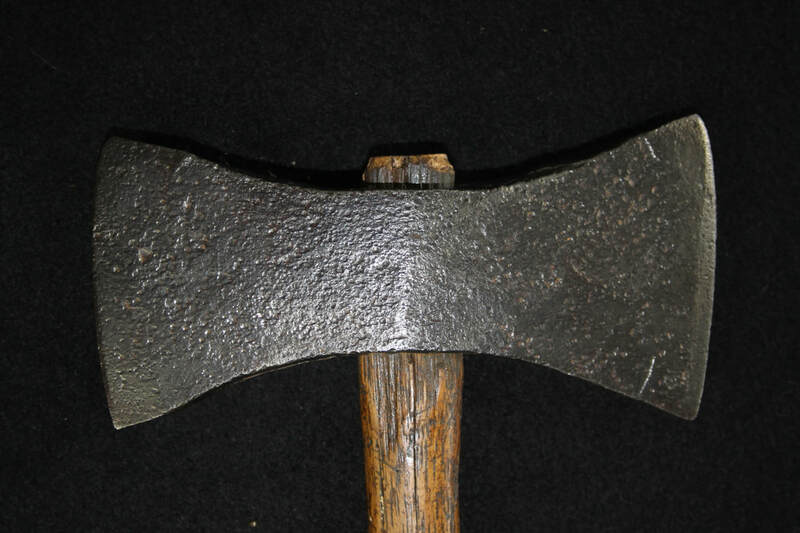 British military broad axe with 4 broad arrow marks indicating military ownership. The 'E' letters are likely indicating Engineers used it for building bridges, etc. It was found underwater in Quebec North of Montreal near a 1760 British site. It appears it was lost after the handle broke. The broad heavy blade is intended to square timbers by slicing along log sides usually after they have been scored with a perpendicular cut every foot or so. ca. 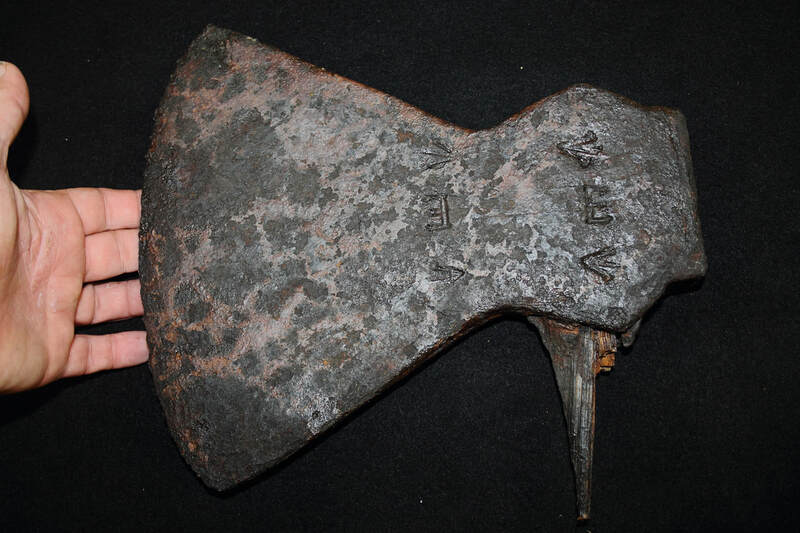 1760 British felling axe blacksmith marked WV with a TAYLOR below it found underwater in Quebec North of Montreal. ﻿"I will tell you, I never was tied to a stake, in my life, to be burned; they had me painted black when I saw Girty but not tied to a stake."